narkel naru are delicious coconut ladoos from the bengali cuisine. these narkel naru are made with fresh grated coconut and jaggery. first heat a heavy kadai. reduce the flame to a low and add 2 cups fresh grated coconut. stirring often roast the coconut for 4 to 5 minutes. do not brown the coconut. the roasting is just to get rid of some moisture from the coconut. then add 1 cup jaggery powder or grated jaggery. mix it very well with the coconut. stirring non-stop cook the coconut and jaggery mixture for about 6 to 7 minutes. the jaggery will melt and mixture will slightly thicken. do not cook too much as then the ladoos can become hard. to test take a small portion and let it cool down a bit. then try to form a tiny ladoo with it. if the mixture easily can be shaped into a tiny ball, the ladoo mixture is ready. switch off the flame and keep the pan on the countertop. add ½ teaspoon cardamom powder. mix very well and let this mixture cool down completely. spread a bit of ghee in your palms and taking small to medium sized portions make the ladoos. instead of ghee you can also use coconut oil. store them in an air-tight container and refrigerate. depending on the color of jaggery, the color of ladoos will vary from light brown to dark brown. this recipe makes about 10 ladoos. serve narkel naru recipe as a sweet. if using regular jaggery , then make a syrup of it with very little water and then strain the syrup. then use this jaggery syrup and add to the coconut. this narkel naru recipe can also be halved or doubled or tripled. 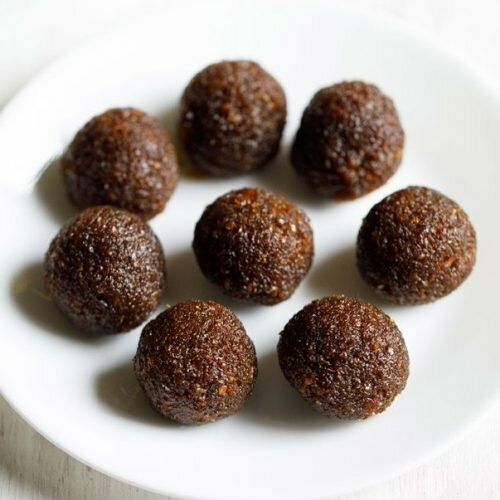 palm jaggery can be used instead of jaggery to make the ladoos.